‘We need a bigger budget for health, and we need it now. We want to see doctors being hired in high numbers,’ Sanco Gauteng chair Chris Malematja said. South African National Civic Organisation (Sanco) and community members as well as the African National Congress today joined a protest by hospital staff at the Chris Hani Baragwanath Hospital. The protesters, who included Incredible Happenings Church leader Pastor Paseka Motsoeneng, were demanding that Gauteng Finance MEC Barbara Creecy allocate a bigger chunk of the provincial budget to health. Such a move would “save the public hospitals” and lessen the burden on staff, proffered the protesters. “It is important for us as the ANC to reflect on these issues that are affecting the workers, particularly the health workers at Bara. This hospital serves a large community, in fact Bara is the pulse of the health system in the country,” said Bandile Masuku, Gauteng ANC ‘s convener of the health and education sub-committee. “If Bara’s issues are not addressed, the whole system will have a problem. We are here to support the [Gauteng Health] MEC, the professors here and the heads of department at Bara. We are here to support Sanco, a civil society movement. 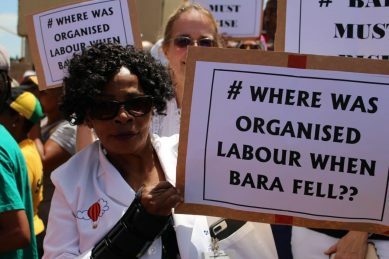 Masuku said it was incomprehensible how public heath facilities were understaffed when there are health professionals seeking jobs in Gauteng. Motsoeneng, better known as “Pastor Mboro”, said government departments must account for the state of affairs at the world’s third largest hospital. “I represent the church, and this is what we stand for. We want to see change. The people working in the hospitals, doctors and nurses cannot just be blamed,” said the pastor. “Those officials are saying they want more resources to help patients, to deliver services efficiently. The numbers of people who came out to protest today [Thursday] have increased from what we had at the previous protest here. The hospital board, it seem, now understand we are not here for fun but we want change. “We are mingling well with the police and there is no violence. It’s peaceful. We don’t have to be broke to care about public health. We who have money and status need to support this thing [the protest]. 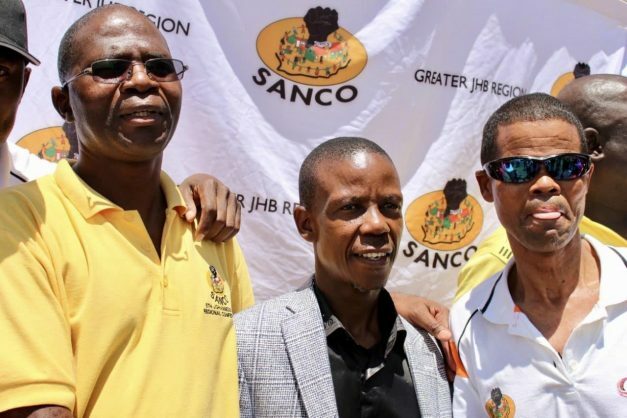 Sanco Gauteng chairperson Chris Malematja said the community organisations could no longer wait from the sidelines when the vast hospital is crumbling. “Our people are dying daily, here. We cannot come here, only to sit and talk politics. Our people are supposed to come here and be treated. It cannot be correct that you get admitted at this hospital, and you will come out dead,” said Malematja. “People are dying here because you don’t have enough staff. These issues are being buried. We need a bigger budget for health, and we need it now. We want to see doctors being hired in high numbers. We want nurses to be hired in high numbers. We want enough security. Malematja said the hospital staff had been intimidated from airing their grievances.